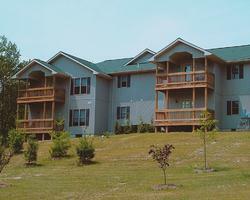 At Woodstone at Massanutten you’ll enjoy the serene beauty of the Shenandoah Valley. This year-round resort offers extensive indoor and outdoor activities. Skiers will find plenty of action at the ski area with it's 1,195-foot vertical drop, the highest in Virginia, Maryland, and Pennsylvania. Golfers will enjoy an 18-hole, PGA-rated or a nine-hole Executive golf course. An on-site sports complex provides all guests with access to swimming pools, racquetball courts, exercise equipment, steam room, sauna, massage services, gymnasium, tennis courts, and children's programs. Your Carefree Journey Awaits!